Envision Energy, a leading Chinese wind-turbine manufacturer, recently commissioned AECOM to design and build their new headquarters located next to their manufacturing plant for rotor components. Taking cues directly from turbines and wind energy, AECOM designed a building that expresses the power of the wind through its massing, exterior skin and interior organization. The exterior features a perforated metal skin and the "Envision Eye" - a solar shading device that looks like the movement of air around an airfoil. Through exhibits and the building's volume, Envision Energy's headquarters also seeks to explain how wind turbines create renewable energy. 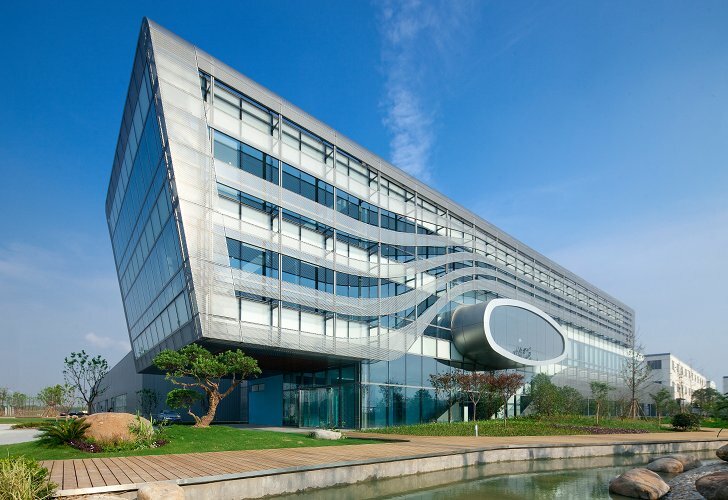 Located in Jiangyin, China, the new 3-storey 3,000 sq meters headquarters is sited directly adjacent to the assembly facility that fabricates the rotor component of Envision‘s wind turbine system. The building includes space for offices, dining facilities, a gallery and exhibition space, and an employee recreation lounge which houses a karaoke room, a theater, a gym, a massage room, and a game room. Envision Energy requested that AECOM design the headquarters based upon the organizing principles of wind, energy, and movement. The building is characterized by two glass volumes that slip against one another along a north and south axis, with a 10-meter cantilevered main entrance on the north side of the building and a roof terrace on the south side of the building. The exterior is wrapped in a perforated metal screen that calls to mind the movement of air as it flows around the central, airfoil-shaped ‘Envision Eye’. The shade screen protects the interior of the building from overheating while still encouraging natural daylighting. The eye serves as a conference room on the entrance side of the building, and the same volume is extended through the building and serves as a connection into the manufacturing plant. This direct link provides the employees with easy access, improves the connection between those who work in the factory and in the offices, and makes the office more transparent for guests and clients. Visitors are also treated with an exhibition of Envision’s products, operations, monitoring, and fabrication processes in the 3-story naturally lit atrium. 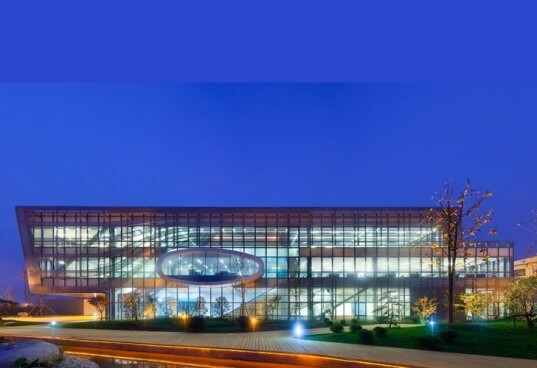 Located in Jiangyin, China, the new 3-storey 3,000 sq meters headquarters is sited directly adjacent to Envirion's assembly facility. The manufacturing plant fabricates the rotor component of their wind turbine system. The building includes space for offices, dining facilities, a gallery and exhibition space, and an employee recreation lounge which houses a karaoke room, a theater, a gym, a massage room, and a game room. Envision Energy requested that AECOM design the headquarters based upon the organizing principles of wind, energy, and movement. The building is characterized by two glass volumes that slip against one another along a north and south axis, with a 10-meter cantilevered main entrance on the north side of the building and a roof terrace on the south side of the building. The exterior is wrapped in a perforated metal screen that calls to mind the movement of air as it flows around the central, airfoil-shaped 'Envision Eye'. he shade screen protects the interior of the building from overheating while still encouraging natural daylighting. The 'eye' serves as a conference room on the entrance side of the building. The same volume is extended through the building and serves as a connection into the manufacturing plant. This direct link provides the employees with easy access, improves the connection between those who work in the factory and in the offices, and makes the office more transparent for guests and clients. Visitors are also treated with an exhibition of Envision's products, operations, monitoring, and fabrication processes in the 3-story naturally lit atrium. The eye creates a physical link from the headquarters into the manufacturing plant. A view into the rotor manufacturing room.